Quickly view detail about sender or recipients from the email. Create or edit CRM records in context with current message. Save message to your CRM in one click. Work with any browser and Gmail Mobile App. 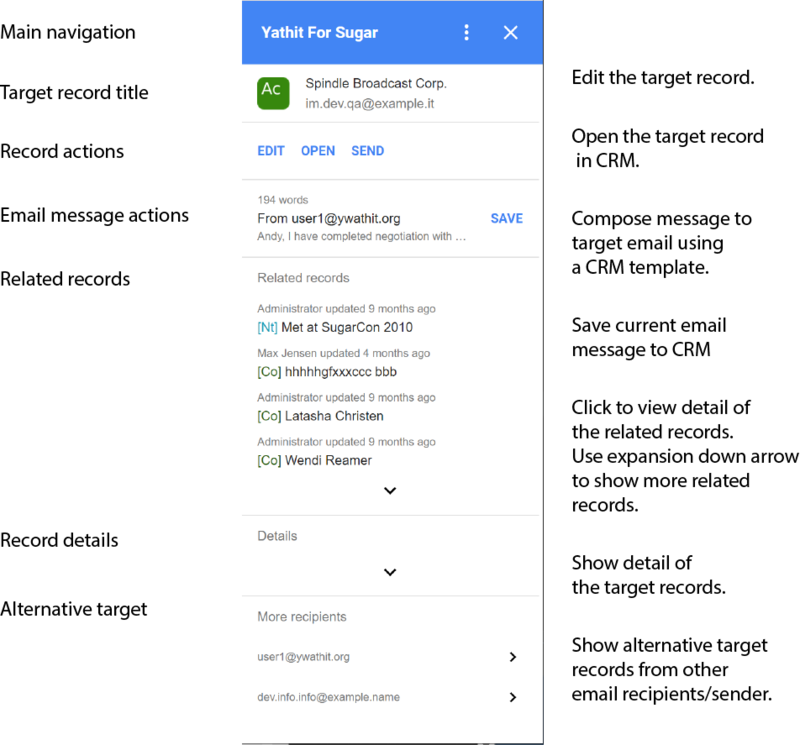 You can use Yathit For Sugar Gmail Addon for free, but all editing features require monthly subscription. Do I need to install Sugar plugin? No. Server-side installation is not required since we use REST API. What edition of SugarCRM/SuiteCRM are supported? We support all versions and edition of SuiteCRM or SugarCRM. Any variance of open source Sugar CE versions will work as long as your server support REST API. Yes. Yathit mobile app recognized LDAP authentication automatically and will use LDAP SSO authentication. SuiteCRM is a registered trademark of SalesAgility Ltd.
SugarCRM and Sugar is a registered trademark of SugarCRM. Yathit is not affiliated with SalesAgility and SugarCRM.